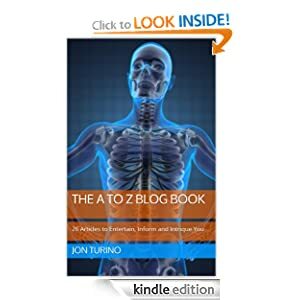 Jon’s very popular 2013 A to Z blog posts have been moved to electronic and printed books called The A to Z Blog Book now available from Amazon in print form and on Kindle in electronic form. Check out a couple of the early reviews then order your copy today. It ROCKS….Thumbs Up – Jeff Pomeroy on Facebook, June 13, 2013. The Kindle Electronic Version is available for only $9.95 $4.95. Download your copy today! Please note: The price for the Kindle version of The A to Z Blog Book increased from $3.95 to $4.95 on July 11, 2013, and it’s worth it!